There are so many paper cutters who do marvelous work... I come across new people daily and feel almost guilty focusing on just one at a time. 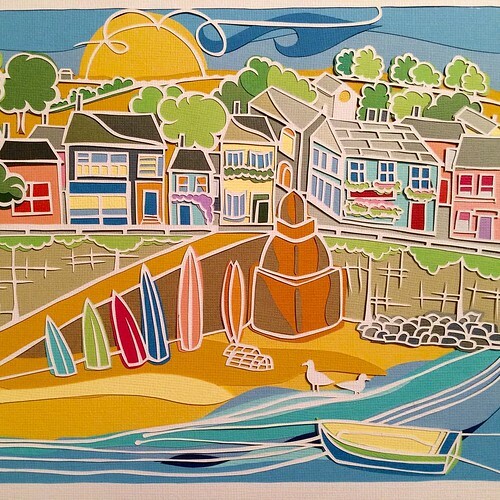 It's hard to resist Sarah King's cheerfully detailed English village and seaside scenes as seen at Apple Seed Paper Cuts. I've admired Sarah's botanicals and celebration trees for a long while. When she began sharing these lively, warm weather scenes on Instagram recently - reminders that summer will actually arrive if we're patient long enough (it snowed here yesterday!) - I wrote to ask what makes her tick as a paper cutter. My name is Sarah King, I'm 45, and I live with my partner, Matt and our two teenage daughters on the Isle of Sheppey, about 35 miles southeast of London. 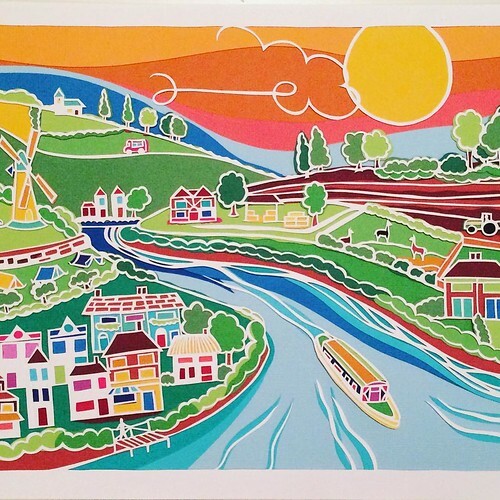 I've been paper cutting for almost three years alongside my day job as a cover teacher at our village primary school. I have no formal art training, but I have always been creative. 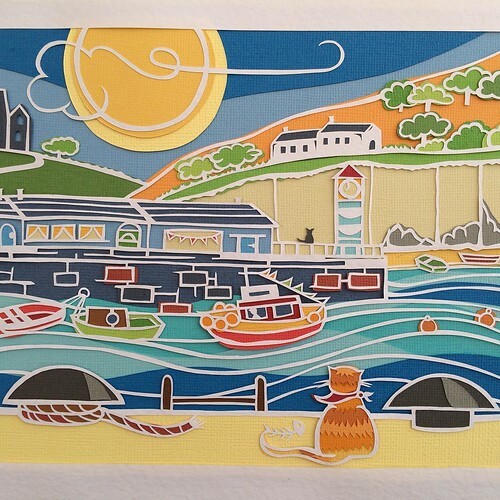 Past pursuits include jewellery making with sea glass, quilling and card making. How did you get started cutting paper? I decided to try paper cutting as a way of making art for our home on a budget. I like typographical, uplifting sentiments, so I bought a starter kit from Paper Panda (Louise Furchau) and went from there using social media groups, such as 'Papercutting and Paper Craft, Trainee - Expert' to refine my skills and share advice. What first attracted you to the art? I love the simplicity of creating a piece with just a pencil, knife, mat and paper, not to mention I can work while still being sociable - at my desk, on the sofa or in the garden. I even take my pencil, knife, mat and paper on staycations! Unlike many paper cut artists, I don't like using a scalpel; my tool of choice is a swivel-headed craft knife. I never make the same thing twice because I enjoy the initial sketching process so much and I get really excited seeing new designs come to life. Most of my earlier works were personalised designs and while I still do occasional commissions, I'm now making time to create pieces of art that I hope are uplifting and nostalgic. 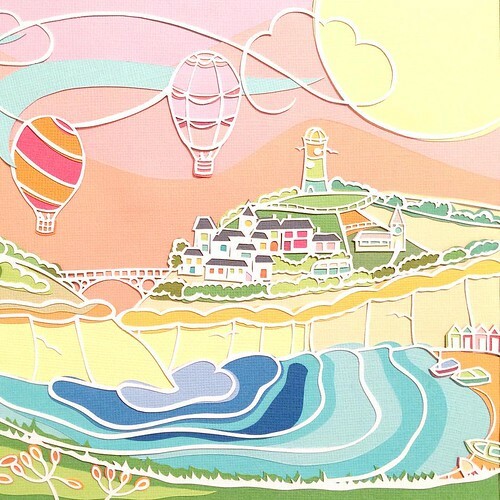 They reflect my own memories of happy days spent at England's coast or in the countryside. I live within ten minutes' drive of quiet beaches, beautiful, watery marshes and lush green fields so I get lots of inspiration all year round. We also love family holidays in Cornwall, among the bustling fishing villages, turquoise seas, majestic cliffs and wide sandy beaches. You have a lovely way of adding zest to your cuttings with textured card and such fine details... tell us about it. My method of using colour 'outside the lines' of the initial paper cut helps me create movement in my pictures and I'm loving working this way. I begin by cutting a layer of sturdy white 175gm art card to which I affix colored card to fill in the scenery. A finished piece is composed of several layers so looks quite dimensional. 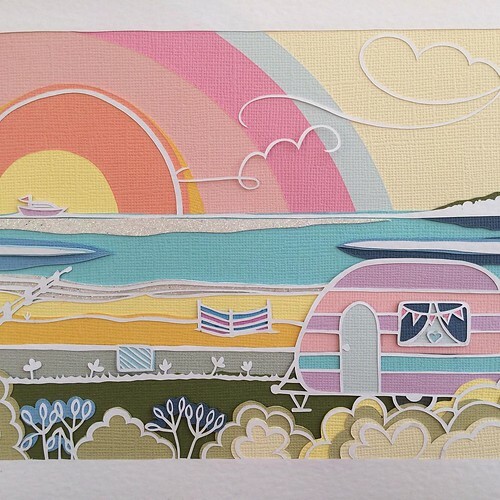 I will definitely be creating more seaside scenes and I'm also working on typical English countryside landscapes. I include little pieces of places I've visited in every picture which is probably why people often tell me a picture looks just like somewhere they know. I'm curious about the tall brown structure on the beach in Harbour Town... what is it? 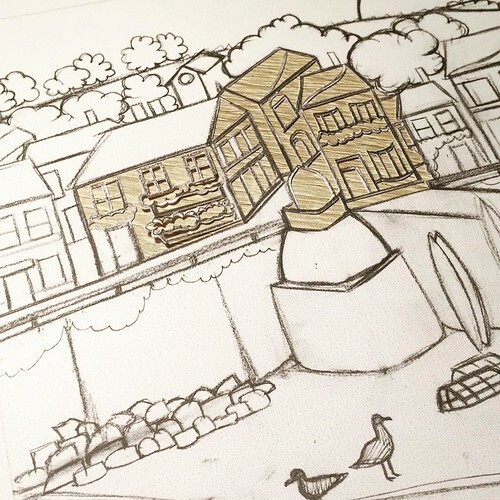 Harbour Town was inspired by lots of different villages in Cornwall, but the brown structure on the beach relates to a WW1 War Memorial in a favourite harbour called Mousehole. I remembered reading about the pride with which the memorial to 36 fallen residents was erected and blessed in the 1920s. The villagers decided to mount the base of the memorial in the actual harbour so that it would be more impressive in height and clearly seen from the land and sea. 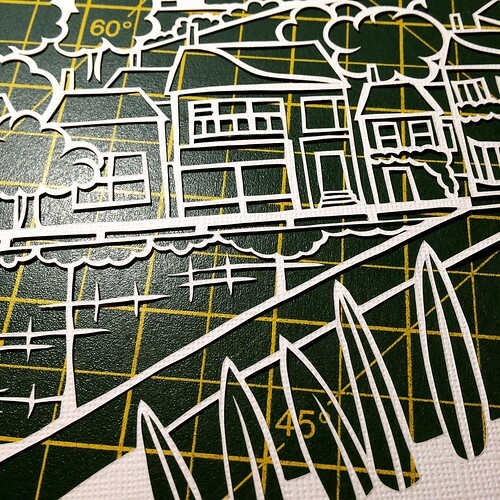 I see that your paper cuts are available as 10 x 8 inch prints via your website and you've also recently started offering additional options via Zippi. Yes, I set up an Apple Seed Paper Cuts page at Zippi. 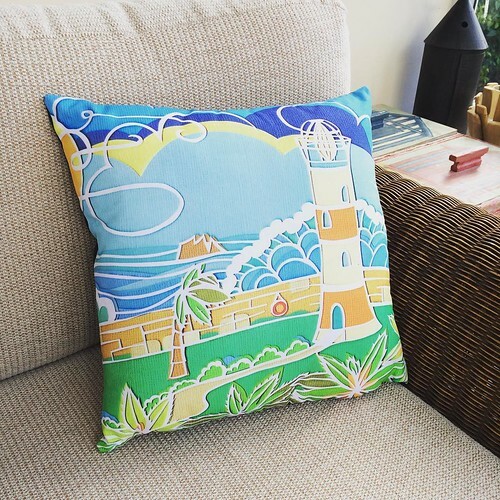 The company, which is based in Southhampton, England, uses my artwork to make up your direct order for cushions, coasters, mugs, phone covers, iPad cases and more. It's perfect for small businesses like mine that have neither the space or money to buy products up front and keep them in stock. Of course I have ordered some items for myself - quality control, you understand - and have been very pleased. Thanks Sarah and happy paper cutting! Contact Sarah King via Apple Seed Paper Cuts, Facebook, Instagram and Twitter. I already know Sarah's work and think it is wonderful. I LOVE that cushion. It has a real 3D quality to it. Colorful, fun and just beautiful, thanks for sharing. I agree, Lisa and cate! Thanks for taking the time to comment.